-Helps relieve the pain and discomfort of gout. -With black cherry powder extract. 1 capsule in the morning and 1 capsule in the evening with a meal. Dairy, egg, artificial preservatives, colours, yeast, artificial sweeteners, wheat, soya, gluten, or corn. 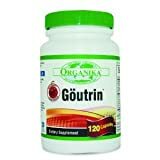 Organika has created Goutrin, a formula to help ease inflammation and decrease uric levels. Black Cherry Powder Extract traditionally has been known to effectively relieve pain and discomfort due to inflammation. Thyme and Mint are both effective diuretic herbs that allow the kidneys to rid the body of excess uric acid. Celery Seed Powder, another diuretic herb, helps neutralize acids in the body. Vitamin C (calcium ascorbate) is an effective anti-inflammatory, as well as being an essential nutrient in the formation of collagen, a protein needed for healthy joints. Gout is an inflammation of the joints caused by the crystallization of excess uric acid. The crystals have jagged edges that irritate the tissue and cause pain. Gout is caused by genetic susceptibility, diets that are high in meat and saturated fat, alcohol consumption, fungal overgrowth, obesity, blood sugar, stress, psoriasis and some abnormal growths.